These are the basic steps it takes to create, edit, view, and plot a new drawing in AutoCAD 2014. Here is an idea of what the finished product looks like. You can find the files used in this sequence of steps. Just download afd03.zip. The Zip file contains imperial and metric versions of the base plate exercise at various stages, and the Read Me file on the Downloads tab describes the files in details. Pay attention to feedback from AutoCAD. Glance at the messages the program sends after each step via the command line or the Dynamic Input tooltip so that you become familiar with the names of commands and their options. Start AutoCAD for your version and operating system by double-clicking the AutoCAD 2014 – English shortcut on the Windows desktop. Windows XP or Windows 7: Choose Start→[All] Programs→Autodesk→AutoCAD 2014 – English→AutoCAD 2014 – English. Windows 8: On the Start screen, click the tile labeled AutoCAD 2014 – English. The workspaces in AutoCAD 2014 look similar to one another. To make sure that you’re using the same workspace as this example, look at the Workspace drop-down list at the left side of the AutoCAD window’s title bar. If the drop-down list doesn’t read Drafting & Annotation, click the drop-down list and then select Drafting & Annotation. Start a new drawing that uses AutoCAD’s default template. Click the application button, labeled with the red A in the upper-left corner of the screen, to display the Application Menu, and then click New. Don’t click the New button on the Quick Access toolbar. You must use the Application Menu. The Select Template dialog box appears with a list of drawing templates (DWT files), which you can use to create a new drawing. 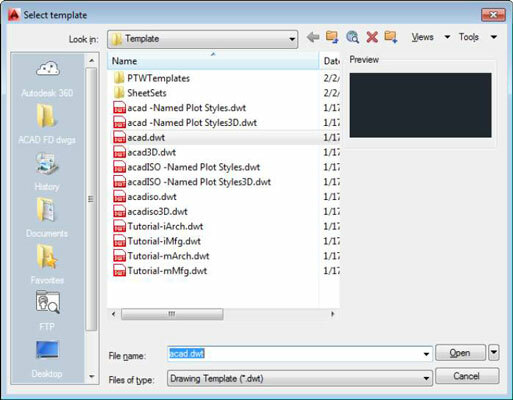 Templates in AutoCAD are similar to templates in Microsoft Word and other programs. AutoCAD creates a new, blank drawing that uses the settings in acad.dwt. The acad.dwt template (acadlt.dwt in AutoCAD LT) is AutoCAD’s default, plain-Jane template for creating drawings that use imperial units (units expressed in inches and/or feet). Set up the initial working environment. Turn GRID on or off. Most beginners seem to like it turned on, and most experienced users turn it off. Some of the other settings can make point selection difficult. Start with them all turned off, and then toggle them on and off as needed. Set the drawing limits that define the working area. Type LIMITS and press Enter. Specify lower left corner or [ON/OFF] <0.0000,0.0000>: Press Enter. Don’t add a space before or after the comma of a coordinate value. We use a special font to show you what AutoCAD is saying. You either type the characters in bold and press Enter, or just press Enter to accept AutoCAD’s default option or recent value. Establish the snap and grid drafting settings. Right-click the Snap Mode button on the status bar and then choose Settings. 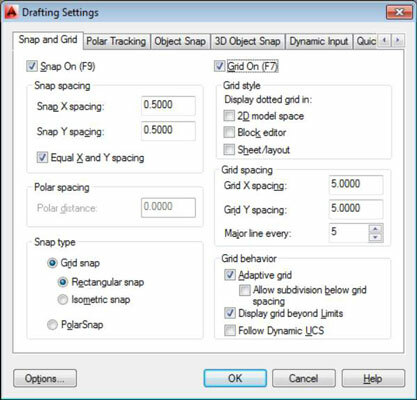 The Snap and Grid tab in the Drafting Settings dialog box appears. 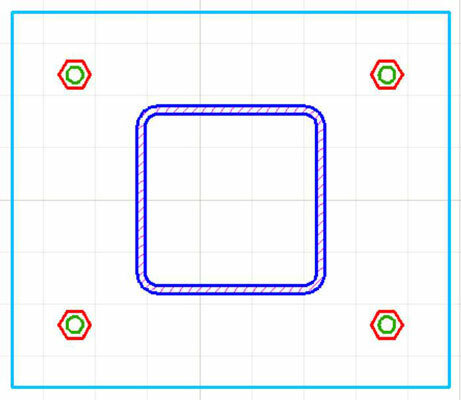 Snap On: When selected, constrains the crosshairs to moving in an invisible grid of equally spaced points. Grid On: When selected, displays a visible grid of little dots or grid lines on the screen, which you can use as reference points. The grid doesn’t appear on printed drawings. You see a network of grid lines, 0.5 units apart, with brighter lines every 5 units, in the drawing area. If you move the mouse pointer around and watch the coordinate display area at the left side of the status bar, you notice that the values still change in tiny increments, just as they did before. Because you haven’t saved the drawing yet, AutoCAD opens the Save Drawing As dialog box. Navigate to a suitable folder by choosing from the Save In drop-down list or double-clicking folders in the list of folders below it. Type a name in the File Name text box. For example, type Detail. Depending on your Windows Explorer or File Explorer settings, you may or may not see the .dwg extension in the File Name text box. In any case, you don’t need to type it — AutoCAD adds it for you. AutoCAD saves the new DWG file to the folder you specified. The good news is that it isn’t necessary to complete all these steps for every new drawing.